GILBERT — The Webster City football team used two first half touchdowns to start the year with a 14-6 victory over Gilbert here Friday night. Trace Kepler had 38 carries for 162 yards and a seven-yard score, with Garrett Whitmore also finding the end zone. Whitmore had 63 yards rushing. Dylan Steen added 44 and Drake Doolittle 34 as the Lynx ran for 303 yards on the night. The Webster City defense had four sacks and held Gilbert to under 200 yards of total offense. Trey Mathis had 10.5 tackles and a sack, Caleb Olson had 7.5 and Malachi Montes recorded an interception. HAMPTON — The Southeast Valley football team had a dominating Week 1 showing, shutting out Hampton-Dumont here Friday night, 40-0. Kyler Fisher ran for 154 yards on 14 carries, scoring three times. Hunter Kruse was 12-for-17 passing for 217 yards with a nine-yard TD strike to Chase Swieter and a 79-yard touchdown pass to Nyles Johnson. 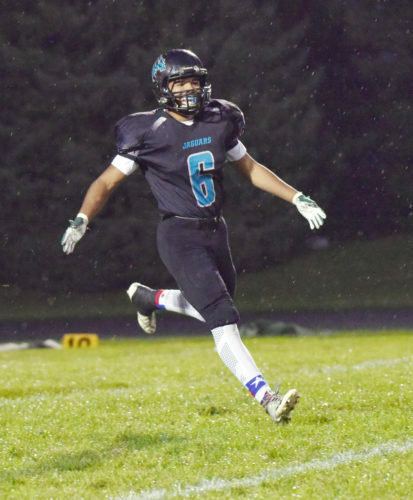 Mason Ackerson also ran in a score for Southeast Valley. LAKE CITY — The South Central Calhoun football team downed East Sac County here Friday night, 39-6. Chase McAlister had a receiving touchdown and a rushing score for the Titans. Keagen Meyer ran for 87 yards and a touchdown, with Josh Henkenius also throwing a touchdown pass to Jared Birks. Birks also had a defensive score. Henkenius was 6 of 14 passing for 80 yards. East Sac County gained 259 yards of total offense, including 166 on the ground. MANSON — The Manson Northwest Webster football team dropped a 40-18 decision to Ogden here Friday night. Derek Girard, a senior, was 18-for-36 passing for 279 yards and two touchdowns to lead the Cougars. Brayden Johll ran for 59 yards and also caught six passes for 71. 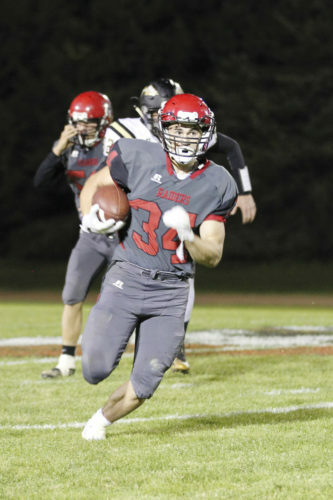 Dawson Estergaard had eight receptions for 129 yards and two scores, with Devin Girard recording four catches for 79 yards. 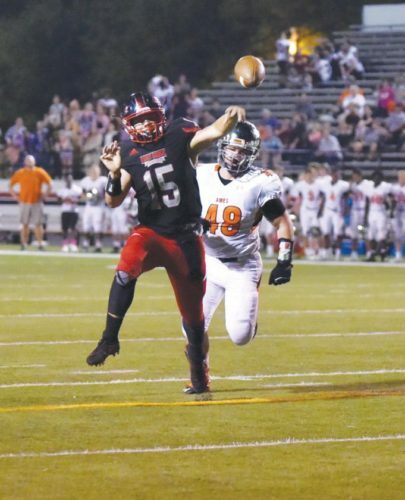 For Ogden, Sam Christensen had 265 yards passing and five touchdowns. HUMBOLDT — The Algona football team claimed a 33-14 victory over Humboldt here Friday night. Jamie Heinz had a 98-yard kickoff return for a score for the Wildcats, and Joey Busse recovered a fumble for the other score. 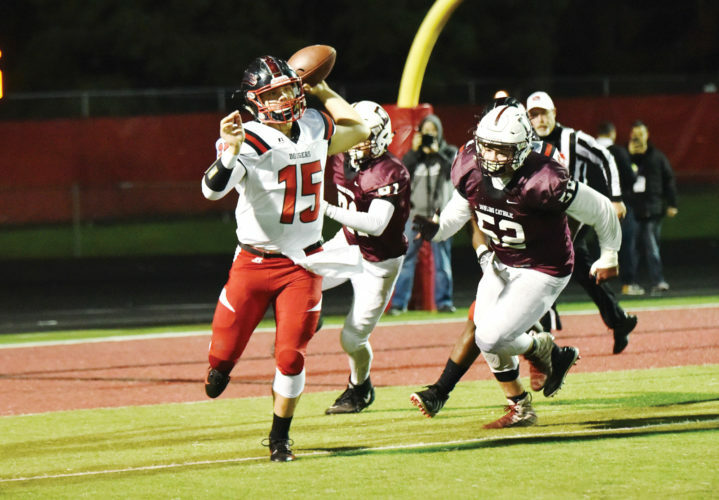 The Bulldogs have now won two straight over their North Central Conference rivals on the gridiron.